Mark Rylance returns to the Globe, which he ran for 10 years, as the poisonous two-faced Iago determined to wreak revenge on a suave and thoughtful Othello, played by Andre Holland. Rylance, under the direction of his wife Claire van Klampen, brings a manic energy to the villainous role. He relentlessly struts and twitches, lurching from cheeky entertainer to psychopathic strategist. The show begins low key, with minimal staging or props, then gathers pace towards an intense violent ending. Jonathan Fensom's costumes refuse to lock us to any particular time or place, encompassing corsets and crinolines alongside jumpsuits. Rylance's bell-boy and MAGA-cap combo perhaps partly illustrate Iago's need to get even with his more elegantly coutured boss. 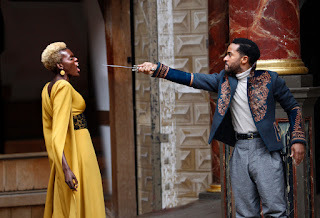 A special mention goes to Sheila Atim as the powerful Emilia who gives her all in the service of a vulnerable Desdemona. 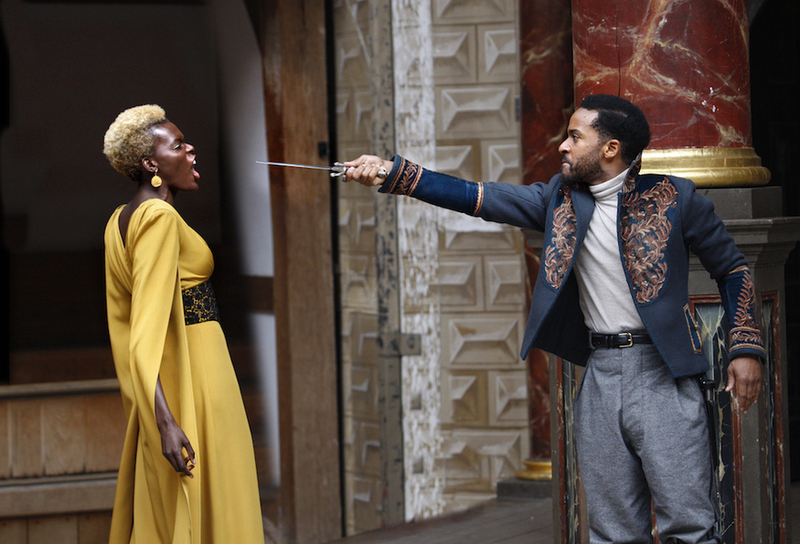 Also Aaron Pierre delights as a wholesome, people-pleasing Cassio unable to withstand Iago's murderous project. The show is surprisingly jovial, with Rylance leading some energetic dancing, as Iago successfully convinces all around him that he is the life and soul of the party and everyone's friend, all the while unleashing alternative facts to spread chaos and destruction.